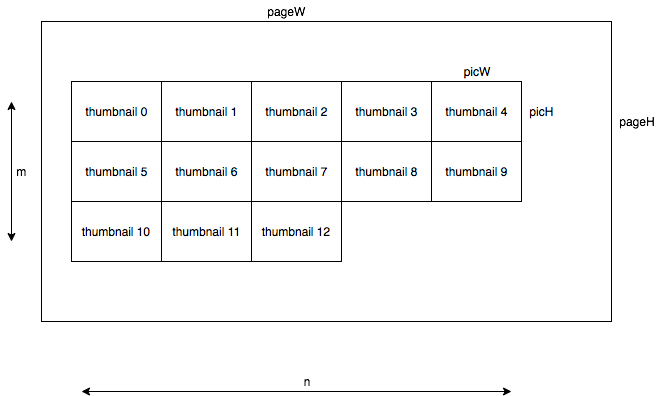 How to layout a given number of thumbnails N of picW x picH into m columns and n rows in a given page (pageW x pageH) so that the “to be applied” scale is maximal? All thumbnails yield the same dimensions, reordering is not allowed, rotation neither. If the chosen scale is maximized, then the result will have the biggest possible thumbnails. I need this for the contactSheet-script, because currently it uses fixed column-sizes and I don’t want to figure this out manually each time the wanted page- or thumbnail-size or the amount of thumbnails changes. int const pageW(ui->pageW_LE->text().toInt()); //maybe validate later! int const pageH(ui->pageH_LE->text().toInt()); //maybe validate later! int const picW(ui->picW_LE->text().toInt()); //maybe validate later! int const picH(ui->picH_LE->text().toInt()); //maybe validate later! int const N(ui->N_LE->text().toInt()); //maybe validate later!